As we scan the skies for Autumn storms, we consider the suitability of this year’s Winter wardrobe. As well as cutting a dash, will we be well enough equipped in the face of roaring sou’westerlies and intermittent freezes beyond? Reaches for a pile of this season’s catalogues, a dark hot chocolate and throws another log on the fire! When we think along similar lines of weather protection around and about our homes and businesses, we look to the roof for loose tiles or home in on crazing and cracks where water may penetrate. Cutting a dash may not seem so key but, combined with protecting a building’s most well-used thoroughfares, could be. 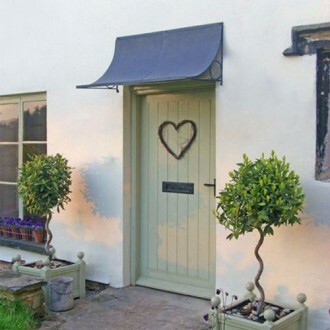 As well as lending stature and style to any doorway, well conceived door canopies and porch canopies aren’t frivolous add-ons but welcome protectors. They give good shelter when guests gather, when one rummages for buried keys, bends down to dry the dog off or when be-shorted, bedraggled postman might need to pause for a signature. Firstly, though, we turn to the building itself. A house, office, shop or hotel might be built of brick, stone, wood, or more contemporary materials. If your place is a carefully hand-built period or contemporary building then the seasoned fabric and details of that property will deserve similar treatment in any embellishments or features. The same goes for the doorway, possibly traditionally panelled, or a wider stretch of French or folding doors. Well-finished, added detailing will only improve on what has come before. At Garden Requisites we’re so pleased to see a return to real recognition for British-made designs and objects that major on being well made and hand made. We believe that the time and skills invested in creating our metalwork structures will serve as a long-lasting legacy for each item. Take a look at the video to see our craftsmen at work and let’s also cast our minds back a certain client who, with artisan touches at the fore, included a GR door canopy in his Chelsea Flower Show garden design. Depending on the style of property, we design and prepare hand-crafted scooped or arched door canopies, solid or latticed, the latter forming a pretty frame for climbing plant cover. As elegant as they are, these are weather-proof features that are made to last, forged from zinc galvanised steel with strongly welded struts and decorations. Hilary and team are always happy to advise on sizing, fixings and installation and will supply the correct kit with each specifically made item. We can also advise on working round existing features. Just give us a call. In the meantime, keep an eye on those weather vanes and get ready to batten down the hatches!